Posted on Mon, Jan 23, 2012 : 2:52 p.m.
A school bus driver was ticketed this morning after a bus with eight Skyline High School students on board spun on an icy road north of Ann Arbor, slid down an embankment and wound up on its side. The driver for the Washtenaw Intermediate School District was ticketed for driving too fast for conditions and has been placed on paid administrative leave during the accident investigation, a standard procedure after any accident, said WISD Superintendent Scott Menzel. 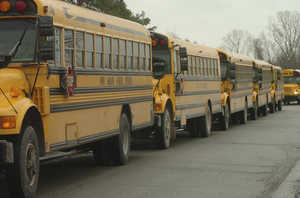 WISD provides transportation services for Ann Arbor, Ypsilanti and Willow Run school districts. Ann Arbor school buses wait in a line in this file photo. A Skyline bus slid off an icy road north of Ann Arbor this morning. No one appeared injured at the crash scene, but Thomas Moore, director of transportation for the Washtenaw Intermediate School District, said three students who complained of headaches have since sought medical attention at an urgent care facility. The bus was traveling south on an unpaved section of North Maple Road south of Stein Road coming down a hill when it hit a patch of ice, Moore said. The bus spun and slid down an embankment before coming to rest on its side against some trees, Moore said. Moore said students on the right side of the bus likely slid out of their seats when the bus landed on its left side. Three students he saw sitting in a sheriff's department vehicle after the crash appeared calm, he said. "They remarkably did not appear to be shaken up." Sheriff's department vehicles transferred the students from the crash site to a new bus, Moore said. Moore could not provide the exact time of the crash, but said it was likely between 7 and 7:30 a.m. The students arrived at Skyline on their new bus about 9 a.m., Skyline High School Principal Sulura Jackson said in a message emailed to parents. Administrators and the school nurse met the students, and parents were notified, school officials said. Moore noted that some roads were icy this morning in outlying areas because of overnight rainfall that fell on top of snow. The fact that the road is on a hill also made it particularly treacherous this morning, he said. A few other buses were not able to make it up hills until the Washtenaw County Road Commission came out to lay down sand and scrape the roads, Moore said. One bus also had to be pulled off an icy patch after it could not gain enough traction to move. Bus drivers were not able to pick up some students in outlying areas because of the icy road conditions, district spokeswoman Liz Margolis said this morning. Moore said he did not know how many students were affected. Moore said paved roads were in good condition this morning, and 99 percent of buses completed their routes with no problems. Moore could not provide a damage estimate for the bus that overturned, but he said it was dented and had some mirror brackets damaged. A tow truck pulled it out of the ditch so that it could be driven back to the bus garage, he said. Jim Harmon, director of operations for the Washtenaw County Road Commission, said dirt roads packed with snow can become treacherous once rain falls. Drivers have been out today laying down sand and scraping those roads, he said. Menzel noted no other buses had accidents this morning, despite some poor conditions. "We're grateful that the students weren't injured," he said. Wed, Jan 25, 2012 : 12:35 a.m. Some facts: WISD is in fact a public, not a private entity. These are still public employees driving these school busses. Another fact, money is not the prime driver in the seat belt issue, the issue is really whether seat belts are practical in busses used for short transit. The same busses are used to transport kindergarten through high school aged kids. Lap belts alone cannot be used; in the event of a hard collision the rider's head would move forward into the seat in front of them, at an angle that would almost guarantee a cervical spine injury. So you equip all the busses with shoulder belts, how to you assure that each belt is adjusted properly for each student? That they can get out quickly in case a car runs under the bus and lights off like a roman candle? Try that with 72 K-5th graders sometime... Statistically, students transported by bus are safer than those who walk or find other sources of transit. As is evidenced by the Ann Arbor bus that once put back on its wheels was able to drive back to the shop, school busses are STOUT. New mirrors, pound out the dents, a coat of paint, intensive inspection, and return it to service. Thu, Jan 26, 2012 : 3:45 a.m.
Not a mechanic, drove school bus when I was in grad school. Awesome job if you like kids and don't have a need to make much money... As an aside, if the kids have had practice (required by law), you can evacuate 60 plus in under a minute if both front and rear doors are available. Wed, Jan 25, 2012 : 2:52 p.m.
You sound like one of the mechanics who works there. Great post. Tue, Jan 24, 2012 : 6:40 p.m. Icy, slippery roads were all over the county Monday morning, not isolated to Ann Arbor! Dexter buses had issues on unpaved roads too. I had trouble on my own unpaved road to get to work, and this was late morning. I was going less than 5 mph when I slip through a stop sign. Where were the county trucks with salt and sand? Didn't they see the weather reports about freezing rain? They should have been out treating roads early. And if the county isn't going to do this, then schools need to close or have delayed starts! If a child had been seriously injured or killed, who's ultimately responsible? The driver, the school district for not closing or the County Road Commission for not treating hazardous road conditions? Tue, Jan 24, 2012 : 11:33 p.m.
Good question. The answer lies with management. Who is the ultimate person responsible? The director. Not the driver. The driver is told what to do and to do their job or less be fired and someone else is replaced. Moore in this case is the sole person responsible for sending us out there in this weather. Look to WISD and blame the management. Good luck. Tue, Jan 24, 2012 : 6:35 p.m.
Tue, Jan 24, 2012 : 12:38 p.m. I drove down this road on Saturday and it was very slippery. I am sure the rain made it even more slick. It would not take much speed if one was driving a bus with all that weight. Tue, Jan 24, 2012 : 6:24 p.m. The responsibility for this accident lies with WISD management, and sadly the incident would have not occurred if only Moore had done his job and made certain of road conditions before thoughtlessly sending buses transporting children on to roads of sheer ice. We were instructed to drive all roads, even after numerous drivers reported that the road conditions were UNSAFE. Only after the crash and other buses required towing were we advised to, &quot;Use our own discretion,&quot; in deciding which roads to avoid. I have to add that this incident is merely symptomatic of the incompetence by which this operation is run. A thorough expose' of WISD by annarbor.com would reveal a picture that A2 parents would find unacceptable and perhaps not to surprised to discover. Tue, Jan 24, 2012 : 6:03 a.m. It was up to the director to close schools or not. Most times we had school and the roads were a mess. Schools should have closed. He is gone and well, I guess the fire got hotter. Good luck drivers. Sounds like WISD isn't thinking very well. AAPS had some great drivers until they started picking and choosing who they wanted. Now it is all messed up. I am hoping Ypsi and WR consolidate removing WISD altogether. Tue, Jan 24, 2012 : 3:32 a.m. I guess they didn't like my famous baseball player analogy. Tue, Jan 24, 2012 : 3:05 a.m.
wonder if its the same bus driver who speeds everyday around the round abouts on miller? too bad the school wouldnt call me back on the matter when I suggested it was a safety issue for the kids. If WISD is listening at all. The school can't call you back on this issue, the bus transportation for students in AAPS is no longer the responsibility of AAPS, it was privatized, you have to call WISD! Maple road turns to dirt outside Ann Arbor city limits? Please tell me why I pay huge Ann Arbor taxes for kids in Barton Hills? Tue, Jan 24, 2012 : 12:31 p.m.
&quot;Please tell me why I pay huge Ann Arbor taxes for kids in Barton Hills?&quot; Of course, you know that you don't. You pay huge taxes for public art and inefficient government. Look at your tax bill. Schools are not funded by your huge Ann Arbor taxes, they are mostly funded by state income tax. Less than 3 mils are collected for bond issues. Those Barton Hills mansions generate more tax revenue for the schools than your little bungalow. Tue, Jan 24, 2012 : 6:08 a.m.
Tue, Jan 24, 2012 : 2:54 a.m. There are dirt roads inside Ann Arbor city limits. And your point is? Tue, Jan 24, 2012 : 1:05 a.m.
not only was there a school bus that rolled over, but 6 other busses went into ditches, and many more were stuck. Drivers were told to proceed to pick up their students before the accidents. it wasnt until after the accidents that they were told to use their own judgement. This is the first time ever in ann arbor that a rollover, and multiple busses in ditches have happened in one day. This could have been avoided. lucky no one was killed. Tue, Jan 24, 2012 : 6:57 p.m. Remember everyone, school bus service for AAPS has been privatized, maybe this is what we get! Tue, Jan 24, 2012 : 2:51 a.m. This is what happens when you an inexperienced bus company take over a great AAPS system. WISD should never gotten into the bus business. Tue, Jan 24, 2012 : 1:21 a.m. Yes, I agree, and this driver gets ticketed and placed on administrative leave because the transportation people made a bad decision. Tue, Jan 24, 2012 : 12:33 a.m. The driver was only going 5 mph. The officer told her that the safe driving speed for the road conditions was 0 mph. In other words, she shouldn't have been driving on that road at all. She was told to &quot;attempt to make the pickups&quot;. No one said anything about using your best judgement until much later in the morning. Tue, Jan 24, 2012 : 2:50 a.m. If I remember correctly some drivers drove too close to the edge anyway on some icy roads. But no tickets were given. Unless you have documentation that this driver was going 5? I have to disagree with you on this one. Must be more then what is being said here. Would love to read the police report. Tue, Jan 24, 2012 : 1:48 a.m. It doesn't matter whether she was going 5 or 6 or 60. According to the officer, she was speeding if she went over 0. Which is ridiculous. Tue, Jan 24, 2012 : 1:29 a.m.
how do you know the driver was only going 5mph? Mon, Jan 23, 2012 : 11:56 p.m.
Mon, Jan 23, 2012 : 11:13 p.m. It boggles the mind that seat belts are the law for all of us except folks who take the bus, especially our children. There are kids on buses who cannot sit in a car without a booster, but somehow on the bus we don't even require a seat belt. I get that installing seat belts would cost money, but somehow car manufacturers responded when required. Wed, Jan 25, 2012 : 2:20 a.m.
From what I've seen on the subject the padded seats are enough. I've also been told that in a serious crash you don't want 50+ people who can't undo their seatbelt. Lastly I was told that a majority of bus crashes involve a smaller vehicle (the 2nd vehicle that is) and it does not cause much damage to the bus or the people on board. That was told to me by an expert traffic crash investigator when the same question came up about seat belts on buses. Mon, Jan 23, 2012 : 9:51 p.m.
Tue, Jan 24, 2012 : 2:48 a.m.
Mon, Jan 23, 2012 : 9:32 p.m.
Tue, Jan 24, 2012 : 6:06 a.m. The Van Buren area is mostly flat terrain. The AAPS area has some wicked hills. Recently there have been mornings when flat dirt roads were drivable with caution but hills impossible. Tue, Jan 24, 2012 : 2:47 a.m.
Tue, Jan 24, 2012 : 12:53 a.m. I lived on a dirt road for the 13 years I spent in AAPS. Bus drivers would not go down dirt roads when conditions got bad, school would be open, but my parents would have to drive me. They didn't ever seem to consider the fact that dirt roads are not always well maintained when making the decision on whether they should cancel school. As long as the paved roads were fine it didn't matter. Mon, Jan 23, 2012 : 10:07 p.m. They are blaming it on the driver instead of themselves. Mon, Jan 23, 2012 : 9:21 p.m.
Why was the driver ticketed? If he or she was driving too fast for the road conditions, it's warranted, but if the accident was unavoidable due to the icy road, cut the driver some slack. I was crawling and slid through an intersection on wet ice...luckily there was no one around to hit or ticket me! Glad the driver and kids are all ok, though. Tue, Jan 24, 2012 : 7:35 p.m.
Tue, Jan 24, 2012 : 2:21 a.m. The sun spot could have pushed the bus further down the road. The driver is a trained bus driver. The ticket was deserved since she is trained and is carrying precious cargo. Tue, Jan 24, 2012 : 1:25 a.m.
From what I see most school bus drivers do not drive carefully on icy and/or dirt roads. I don't doubt they were driving too fast for conditions. Tue, Jan 24, 2012 : 1:18 a.m.
AACity2, so was a popular baseball player at Parker and Scio Church. Mon, Jan 23, 2012 : 11:59 p.m.
You were driving too fast for the conditions. Mon, Jan 23, 2012 : 11 p.m. It does seem likely that gravity caused the bus to go faster, not necessarily more pressure on the gas pedal. Even downshifting can't stop a slide on ice. Yes, I agree with you. Not too long ago another driver slid trough an intersection, hitting a car who had the right of way and then careening into 3 (or 4?) other cars and failed to get a ticket. The ticket in this case is wrong.